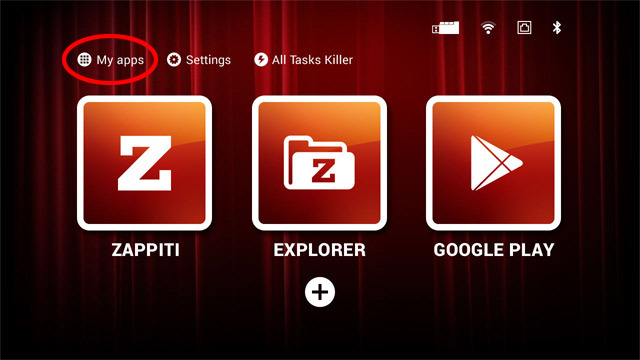 Instead of using Google Play to update your apps Zappiti and Zappiti Explorer, you can use this procedure to update your apps through USB. 1. Please download the following files and place it on USB stick (NTFS, Linux, OSX or FAT32). Warning! Internet Explorer is not abble to download correctly the .apk files. Please use another web browser such as Google Chrome or Firefox. 2. Connect the USB stick to the Zappiti Player 4K. 3. Switch ON your Zappiti Player 4K. 4. On the main page (Home page), please click on "MyApps". 5. The, click on "Media Browser". 6. Click the right mouse button and browse the USB stick. 7. Locate the APK file and click on the first one and follow the action on the screen. 8. After the first application is installed, please repeat the procedure with the second installation file APK.